The content of this post was my reply to a question on Quora. Compiling it here. Thanks to my teachers for sharing this knowledge. Hinduism is Sanaatana Dharma. There are a number of meanings for these words, “Sanaatana” and “Dharma”, depending upon the level of sophistication involved. On a basic level, Sanataana is that which is not time or space bound. The word “Dharma” has no equivalent singular word in English. It is derived from the Sanskrit root ‘Dhr’, meaning ‘Dhaaranaat’ or “That which supports”. This word Dharma can be understood as varieties of orders present in Srushti (सृष्टि – physical and mental universe), all of which support the existence of Srushti. 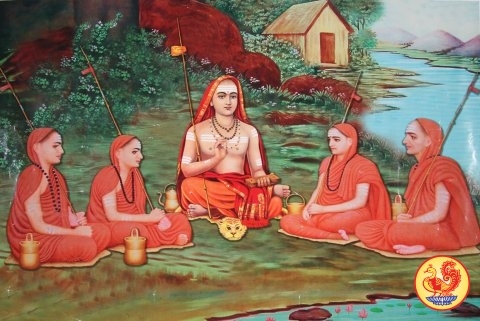 There is the physical order by which the physical objects interact with each other, the physiological order which governs the bodies of all living entities, the biological order which is manifest in natural evolution, and the psychological order of the conscious beings of Srshti, called the ‘law’ of karma, which governs their experiences. Since all these orders together support Srshti according to Hinduism, they are all collectively known by the word “Dharma”. Of these orders, the physical, physiological, biological orders are all known and understood through what is known through the sense-organs and through applying rigorous logic to the knowledge obtained through the sense organs. These sense-organs are roughly known as “Pratyaksha pramaana” in the Indian epistemological studies or Pramaana Shaashtram (Pramaana means “means of knowledge” or “instrument of knowledge”). Logic, when it is used to obtain knowledge, is known as “anumaana pramaana”. The first three orders are therefore accounted for by the pratyaksha pramaana and anumaana pramaana, applied to the knowledge obtained through pratyaksham. Now, the the fourth order, the psychological order, the ‘law’ of karma, basically indicates the free-will of the individual and the link between the individual free-will and his experiences in life, is not knowable completely through the pratyaksha pramaanas. This is however known through the means of knowledge called “Veda”. Thus, the Veda becomes a Pramaana, called Veda Pramaana, or Shaashtra Pramaana, to know what Dharma is, in the context of psychological order. Sanaatana Dharma is therefore basically the body of knowledge obtained through this Veda Pramaana about Dharma. This is one meaning for Sanaatana Dharma. The understanding of Dharma in this way as a psychological order, therefore leads to the adoption of values like ahimsa (principle of minimum harm), etc., which harmonise the life of any conscious entity with that of the environment around him. A individual leading his life according to Dharma is thus harmonious with his surroundings, and is able to enjoy life not simply as a consumer but as a positive contributor. The knowledge obtained from the Veda Pramaana is also manifested in various forms through various texts such as Smrtis (like Bhagavad Gita), Puraanas (like Bhagavata Puraana), and Itihaasas (like Mahabhaarata). There is yet another meaning for the word “Dharma” based on its direct translation, i.e. “That which supports”. According to Sanaatana Dharma, this “support” of all Srshti, i.e., all these orders present in Srushti, are only manifestations of the Lord, who in Sanskrit is called Ishwara. The word Ishwara is derived from the root “Ish” which means “To lord over” or “to rule over”. Unlike the Judeo-Christian concept of a God who sits somewhere in Heaven, who ever ‘watches’ over people in His creation, and who ultimately judges each being for its actions, Ishwara according to Sanaatana Dharma both pervades and transcends Srushti. His “lording over” or “ruling over” Srshti, is therefore not in the way of watching and judging from outside, but rather by by pervading through Srshti, and by manifesting as Srshti including its various orders. In other words, Srshti which includes the jivas (individual entities) and its various orders do not exist separately from Ishwara. Ishwara pervades Srshti, just the cotton in the cotton shirt pervades the shirt, or like the wood in the wooden table pervades the table. But Ishwara is not simply a inert, unconscious, material thing like cotton or wood. Ishwara is a conscious being who pervades the entire Srshti according to Sanataana Dharma. The Veda gives the example of a dreamer dreaming a dream to help us to understand how Srshti is created, pervaded and also transcended by Ishwara, who is a conscious being. 1. The dream created by the dreamer does not exist without the dreamer, the dreamer being the ‘sentient’ cause of the dream. 2. The dream of the dreamer is pervaded by the dreamer. Without the dreamer none of the objects in the dream exist. The dreamer is therefore also the ‘material’ cause of the dream. 3. The dreamer however independently exists without depending on the dream for his existence. The first two points above indicate the pervasiveness of the dreamer and the dependent nature of the dream on the dreamer. The third point indicates the transcendent nature of the dreamer with respect to the dream. In the same way, Ishwara, the Lord, also pervades/supports and transcends this Srshti. This knowledge about Ishwara is also gained from the Veda. And because Ishwara is the the real support of Srshti (i.e. Ishwara is immanent, he pervades Srshti) and because the Lord is also Sanaatana (not bound by space or time, i.e. who is transcendent), Sanaatana Dharma is also that body of knowledge which reveals this Ishwara. An individual who understands this Ishwara in his totality, and is without any kind of a doubt about his understanding, gets complete peace, security, and happiness here and now while living on earth itself. The individual gets this because all his fears of being a small entity in this creation, who has to fight for survival, who has to compete for glory, etc. are all destroyed, since he understands that the Ishwara alone appears the world and all its individuals and since he is never away from Ishwara, the glory of Ishwara is available to him as his own glory also. Thus all emotional struggles come to an end and the person understands that in his real nature he is not separate from Ishwara who is the complete, ever-fulfilled support of Srshti. This is called Moksha in Sanskrit. For a collection of brief videos on Hinduism understood in this way, please see – https://www.youtube.com/watch?v=YnNfDRsRcTA. Further information about this body of knowledge known as Sanaatana Dharma or Hinduism can be gained by seeing, listening to and understanding the concepts presented by this teacher, Swami Dayananda Saraswati or any of the teachers in his tradition, called the AVG parampara. This teacher succinctly put the fundamental teaching of the Sanaatana Dharma in a small sentence – “There is nothing here that is not the Lord, everything here is Ishwara”. This is Hinduism in short, and a person who lives his life according to this vision is a Hindu.